Is Brand Bidding in Google Ads Worthwhile? Brand bidding is when a business bids on their own brand name as a keyword within a Google Ads campaign. 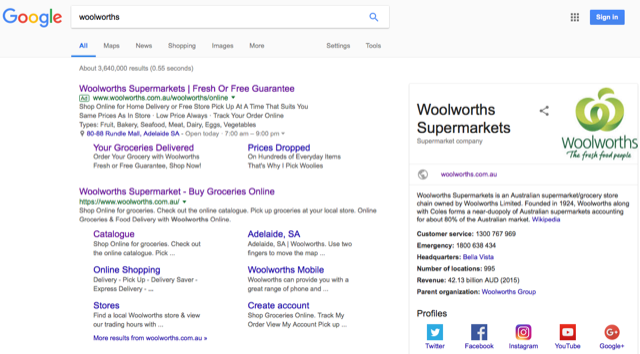 For example, in the screen grab below Woolworths is bidding on the keyword ‘Woolworths’. It’s a common question whether or not this is a worthwhile strategy – especially if you’re already in first position on the search results page organically. Below are three reasons why I recommend giving it a go. If all your marketing efforts are working, customers will be aware of your brand and will be searching for your brand name directly. These are customers that have every intention of engaging with your brand either through an enquiry, sign-up or sale. Assuming you already show in the first position on the search page organically, a branded paid search ad will take up additional real estate on the first page of the search results. This gives your brand more prominence and reasserts new customers you’re a major player in the market. With your brand ad, you can highlight important information that may not appear in your organic listing for example an attention grabbing special offer or location update. Including click-to-call extensions for mobile and site-link extensions gives customers quick links to up to four different pages of your site – improving the user experience. In the Woolworths example above, you can see the strength of combining the paid and organic listing. The combined messaging takes up the first page and highlights a broad range of services, products and helpful information. In the paid brand ad, they have highlighted their ‘Fresh or Free Guarantee’ which doesn’t appear organically and have also pulled out their ‘Grocery Delivery Service’ and ‘Same-Day Pick Up’ as two quick links for customers. Because branded ads are highly relevant to the content of your website and domain name, they usually get extremely high quality scores. This is because customers are directly searching your brand so click volumes and click-through-rates are high. The impact of the high quality score, can be felt throughout the entire Google Ads account. This is because Google rewards advertisers with high quality scores by lowering their cost-per-click, improving ROI for even your higher cost non-brand campaigns. Remember, don’t just bid on your company name, test specific products or even your domain name like Woolworths in the screen grab below. More often than not, when someone searches your brand name, they will be sent to your homepage because the first organic listing for your business is most likely to be your homepage. When you have a new promotion or product launch you may want customers to go to a different page. Organically this is pretty hard to achieve. However, if you create a paid search campaign you have the ability to control this journey and even test different landing page experiences to optimise conversions. Definitely worth considering. Bidding on your brand name gives you more control and flexibility on your brand search results page. You can grab more attention from increased prominence above the fold plus have more flexibility to drive customers to different promotional landing pages. And to top it off, the keywords are generally quite reasonable and can improve your quality score. Win, win. While not the right strategy for all businesses, I definitely think it’s worth testing to see the impact on your Google Ads account. Happy brand bidding!